The George Wythe Collection is Now Available in Legal Classics! In February, we announced that the Legal Classics database had reached more than 11,000 titles. We are now excited to announce a new addition to this database! The George Wythe Collection, composed of 160 titles, is now available in Legal Classics. Although the George Wythe Collection is much larger than 160 titles, the HeinOnline collection contains mainly law-related content. This collection has been added at no additional cost to subscribers. Last month, HeinOnline’s Legal Classics database reached another milestone: it now contains more than 11,000 titles! The Hein Company once brought a DeLorean to an AALL conference, as a metaphor demonstrating that HeinOnline makes it possible to go back in time by preserving pieces of legal history for our users and for future generations. By digitizing images of books, periodicals, statutory materials, and more, HeinOnline makes it possible to access material online exactly as it existed in its print format. Original fonts, charts, and notations are included for each title, and all documents are fully searchable. Having HeinOnline is like having an entire print library at your fingertips. HeinOnline’s Legal Classics library is everyone’s favorite library for finding works from some of the greatest minds in history, including works from William Holdsworth, Henry Maine, Federick William Maitland, Frederick Pollock, and many more. This month, we added a completely new sub-section to the Legal Classics library titled History of Remedies. This new sub-section features a never-before-published work by John R. Wilson titled Cases on Remedies. With the April release, we added the ability to browse by date in the Legal Classics, World Trials and books section of World Constitutions Illustrated libraries in HeinOnline. When you choose to browse by date, the titles will be organized by year published and arranged in chronological order. We have integrated cross-library searching of books to the Legal Classics Library in HeinOnline. Now when searching for a title in Legal Classics, you will get results from History of Bankruptcy: Taxation & Economic Reform in America Part III, Intellectual Property Law Collection, New York Legal Research Library, World Constitutions Illustrated, Scottish Legal History, Selden Society and/or World Trials, provided the results are relevant to your search terms. In the Legal Classics and World Trials libraries, you may come across titles that have multiple volumes. Some sets are more extensive than others, but in any case, you may want to search only a volume or two rather than search across the entire set. Thus, this week’s tip is focused on how to search a specific volume of a specific title in the Legal Classics and World Trials libraries. Looking for a “Classic” from tens or even hundreds of years ago that has to do with Transportation or Constitutional Law or another subject of interest? 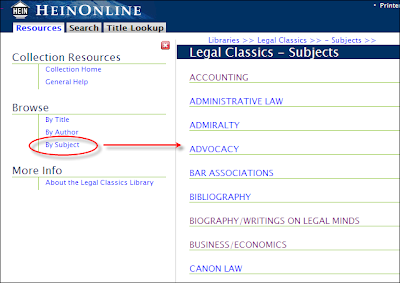 We’ve made it easier to find a Classics title, by providing the ability to browse by subject or search by subject in the Legal Classics collection. In building this capability, we identified over 70 subjects that classify the content of the titles. We then related every title to at least one subject and in many cases multiple depending upon the title’s content. The browsing and searching capabilities are further defined below.